After announcing a monster lineup, including Steve Hackett (Genesis), Nick Johnston (Canada) and Alex Hutchings (UK), the Australian Music Association (AMA) have added even more excitement to the incredible weekend of music with the announcement that Diesel will be performing and chatting exclusively at the Melbourne Guitar Show at Caulfield Racecourse over the weekend of 5th and 6th August. With the complete event program (detailing the show hour-by-hour across five different stages) and final list of performers and exhibitors now available for all to feast their eyes on, festival-goers have the ability to plan their ultimate Guitar Show experience to a tee, ensuring they don’t miss out on a thing. And the AMA could not be more proud to welcome the much-loved and respected Aussie performer, Diesel, who is set to make his debut Melbourne Guitar Show appearance in clinic for VOX at this year’s event. Well known for his 90’s hit Tip of my Tongue, Diesel is stoked to pay a visit to the Guitar Show, saying, "Can’t wait to head to Melbourne to play and talk about some of the gear I'm loving using, amongst the guitar-loving community." Set to be bigger than ever in 2017, the Melbourne Guitar Show has gone above and beyond to offer music enthusiasts the weekend of a lifetime. Proudly presented by Triple M and Australian Musician, the lineup boasts not only an impressive haul of Australian guitarists on display, but a bunch of international artists too. The lineup has been heavily curated to showcase just how dynamic and diverse the world’s most popular instrument is, with multiple genres and styles being represented – there’s definitely something for everybody, even the ukulele enthusiasts among us! There’ll be a stack of performances as ever, but there will also be some exclusive, unique opportunities for punters to get up close and personal with their favourite artists, through a number of workshops and panels that will take place throughout the show. Among the talented bunch joining the packed schedule of seminars and demonstrations are Australian artists Lloyd Spiegel, Brett Kingman and Bob Spencer. Partnering up with Triple M, Aon, Advance Audio and Franklin Printing, the Melbourne Guitar Show will be Australia’s largest pop-up guitar shop, home to over 80 exhibitors over the weekend, including all the industry’s heavyweight brands from Australia and overseas. For the comfort of patrons, there is a designated Acoustic Mezzanine where fans can try the best acoustic instruments on offer. Not only will the 2017 MGS provide a hands-on chance to see, hear and play a broad range of the world’s favourite brands, it will also see exhibitors offering great show deals, and an opportunity to get close to some hand-crafted locally made instruments and an epic historic guitar collection tracing the very roots of the guitar today from harp to lute to primitive ‘guitar’ evolution examples on show. There’ll be a Triple M finale jam featuring a host of the weekend’s best known guitarists and punters can even catch a movie amongst the festivities! 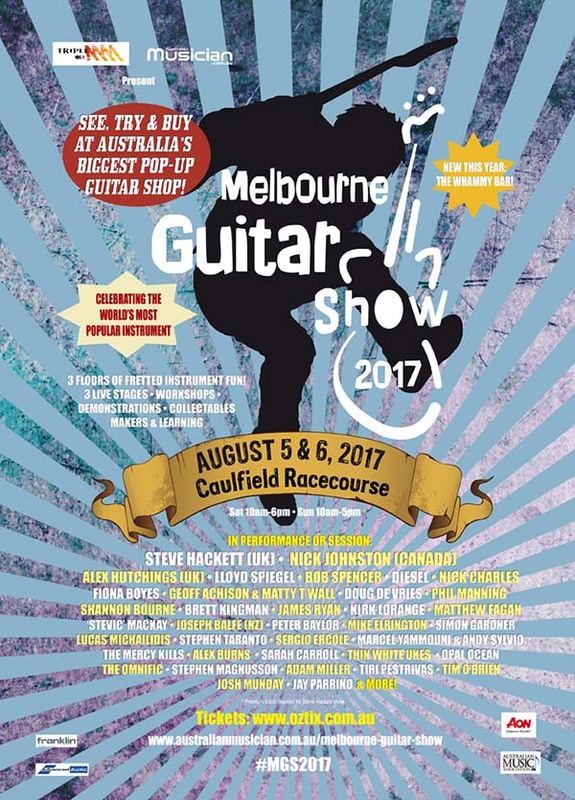 The Melbourne Guitar Show will be held at Caulfield Racecourse on 5th and 6th August.